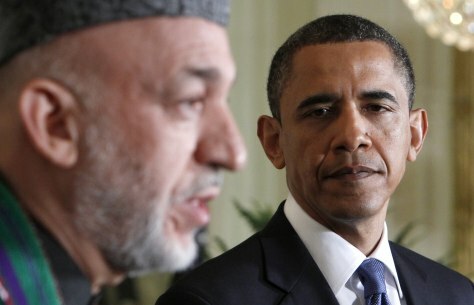 Afghan President Hamid Karzai, seen here with President Barack Obama at the White House on May 12, was among the world leaders whose name came up in leaked U.S. diplomatic cables. Called the "Sept. 11 of world diplomacy" by Italy's foreign minister, the leak of 250,000 U.S. diplomatic cables has revealed how some U.S. officials view certain world leaders. Below are some of those comments, along with initial reaction from abroad. >>> release of classified documents from wikileaks . >> reporter: this is the third and by far the biggest release of u.s. secrets by wikileaks . u.s. officials say some of these leaks pose a serious threat to national security . but almost all are stunningly embarrassing. it seems that no one is spared in these cables obtained by wikileaks . the personal critiques by u.s. diplomats almost read like a teenag teenager's tweets. thin skinned like an emperor with no clothes. libya's home mar gadhafi, strange. a it's not going pretty in many cases. >> other cables provided in advance to a number of media outlets reveal the secrets of u.s. operations overseas. efforts in yemen -- one cable in january says yemen told david petraeus we'll continue saying the bombs are ours not yours. and in an effort to get pakistan to hand over enriched uranium from these reactors, it ultimately failed to pakistan was afraid it would be portrayed a as the united states taking pack can's nuclear weapons. >> reporter: this could shake governments, it could end programs, and it could seriously imperil u.s. foreign policy . >> but one of the most embarrassing revelations may involve the u.s. state department . hillary clinton and condoleezza rice ordered intelligence services to gather intelligence on -- the prime suspect in these massive leaks remains pfc bradley manning who remains in military custody, charged with downloading thousands of state department documents, many of which reportedly appear in this latest wikileaks release. now on the heels of this latest dump of u.s. secrets, some members of congress are calling on the obama administration to try to actually shut down wikileaks and charge wick i can leak's operators with espionage. that's highly unlikely. so instead the state department and the pentagon are looking for ways to tighten up their security to try to prevent such massive leaks in the future.